The subject of this portrait was Modigliani's last mistress, Jeanne Hebuterne (1898-1920), whom he met in July 1917 when he was thirty-three and she was a nineteen year old art student, at the Academie Colarossi. Hebuterne - a gentle, shy and rather delicate girl - was introduced to the artist in the Spring of 1917, by the sculptor Chana Orloff (18881968). They became lovers, and soon fell deeply in love, despite the age-difference as well as severe opposition from her parents. In the last three years of his life, Modigliani painted Jeanne in more than twenty works but not once does she appear naked. 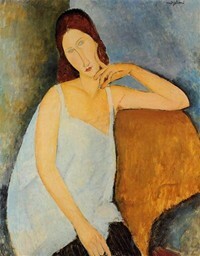 Modigliani chose only professional models for his nudes. Jeanne Hebuterne was to all intents and purposes his wife. The Metropolitan Museum's portrait of Jeanne is unique in that it is the only one showing her less than fully dressed. Her white chemise, however, suggests modesty and chastity. She was almost certainly pregnant at the time - she gave birth to a daughter in November 1918. When Modigliani died from tuberculosis in early 1920, Jeanne - pregnant with their second child - committed suicide. The painting is lovingly voluptuous in its every detail, from Hebuterne's long almond-shaped face, with its softly falling auburn hair, her gently sloping shoulders and slender arms, to her ultra-feminine wrists and hands. Especially interesting is the positioning of her left hand, which mirrors the gesture of Madame Moitessier in her portrait by J.A.D.Ingres (1856). Modigliani liked to depict his sitters in a shallow, confining space so as to increase the sense of intimacy of his portraits. His background is usually an interior wall, with a corner or door offering a geometric framework for the natural curves of the figure. This portrait is a study in curves; the line of Jeanne Hebuterne's back is continued through the shoulders until it arcs downward again along the edge of the chair to make a large ellipse. The woman's oval head is tilted in the opposite direction. Modigliani united in his work such diverse influences as the Italian Renaissance, African tribal art, and the portrait compositions of Paul Cezanne (1839-1906). However cool and elegant, his unmistakable style was the product of both his passion for observing the human form at close quarters and his profound feeling for the individuality of his subjects. In the Autumn of 1918, he took Hebuterne to Nice on the French Riviera where he hoped he might sell some of his modern art to wealthy tourists who wintered there. Returning to Paris in the Spring, Modigliani developed tuberculous meningitis and his health deteriorated badly. On January 24th, 1920 he died. The following day, Jeanne Hebuterne threw herself out of a fifth-storey window, killing herself and her unborn child.  Portrait of Madeleine Castaing (1928) by Chaim Soutine. Painting of his leading supporter.  For the meaning of other expressionist paintings, see: Homepage.